A dental implant replaces a missing tooth root. The implant is attached to a porcelain crown or other restoration with an abutment. Dental implants can be used to replace a single missing tooth, several missing teeth, or all your teeth. The implant looks, feels, and functions in the same manner as a natural tooth. Because it replaces the tooth root as well as the visible part of the tooth, it helps deter bone loss. When you are considering receiving a dental implant, we will discuss the pros and cons with you, such as options that are easier to clean and others that are more affordable. Together, we will decide on the best choice for your individual needs. 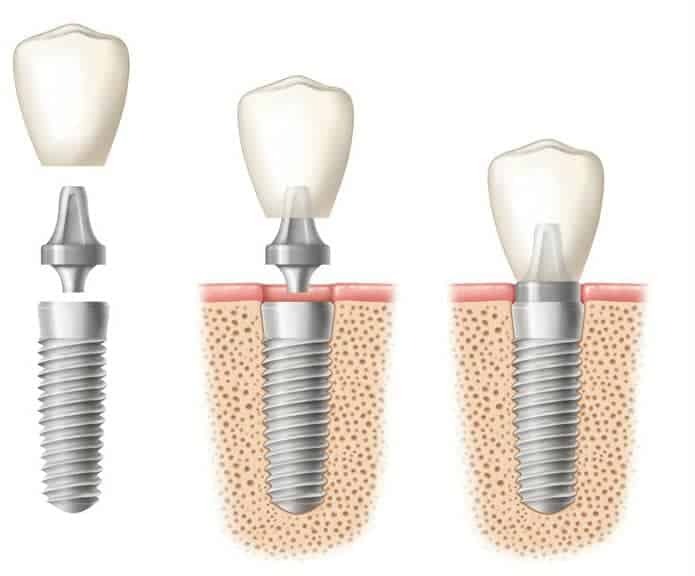 The first step in our dental implant procedure is a consultation. We’ll listen to you and evaluate your medical history to see if there are any conditions that could affect the success of the procedure. We’ll then proceed with a comprehensive oral exam. We’ll complete a set of digital x-rays, screen you for oral cancer, and check for and chart any gum disease that may be present. At this point, we’ll discuss the results of the exam with you and explore the treatment options that best fit your situation. We will make sure that you have time to ask all the questions you want to ask and to get answers before we begin any work. We’ll then engage in a thorough planning process that will include the use of our high-tech 3D CT Scanning system. This will enable us to plan the exact placement of the implants to avoid impinging on blood vessels and nerve cells within the jawbone. It also shows us the location of the sinuses and helps us evaluate the density of the bone structure. And finally, we will see to your comfort before, during, and after the procedure. If you would like to learn more about dental implants, click here to read our What Are Dental Implants page. Call our office or request an appointment online.